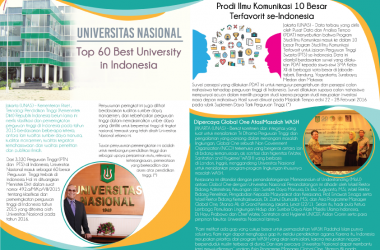 Universitas Nasional (hereinafter referred UNAS) is a Private University, the oldest and second oldest in Jakarta in Indonesia. Founded on October 15, 1949 on the initiative of leading figures who gathered in Perkumpulan Memajukan Ilmu dan Kebudayaan (PMIK). The founders consist of: R. Teguh Suhardjo Sastrosuwingnyo, Mr. Sutan Alisjahbana, Mr. Soedjono Hardjosoediro, Prof. Sarwono Prawirohardjo, Mr. Prajitno Soewondo, Hazil, Kwari Katjabrata, Dr. Djoehana, RM Soebagio, Mr. Adam Bakhtiar, Ny. Noegroho, Drs. Adam Bakhtiar, Dr. Bahder Djohan, Dr. Leimena, Ir. Abd Karim, Prof. Dr. Soetomo Tjokronegoro, Mr. Ali Budiharjo, Poerwodarminta, Mr. Soetikno, Ir.TH. 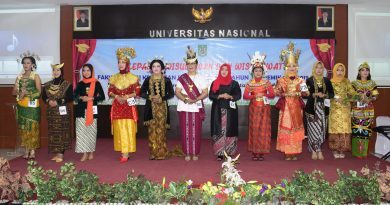 A. Resink, DR. Soemitro Djojohadikusumo, Noegroho, Soejatmiko, HB Jassin, Mochtar Avin, L. Damais, A.Djoehana, Nona and Nona Roekmini Boediardjo Singgih. Establishment UNAS was intended to accommodate high school graduates in Jakarta who will not enter the University of Indonesia’s Van of the Dutch colonial government. In fact, amid the struggle for independence of physical revolution, UNAS is also a “fortress forefront of” the struggle of the people of Indonesia in Jakarta. For their dedication, then on the second Lustrum UNAS, 1959, First President of the Republic of Indonesia, Ir. Soekarno bestowed the title “UNIVERSITY OF STRUGGLE”. The effort was initially made for courses covering areas such as economics, sociology, politics and philosophy, led by Drs. Adam Bachtiar. The courses are aimed at providing basic understanding of science for every citizen in the independence of responsibility. In the same year, 1946, evening high school is also held to provide opportunities for those who work in the morning. In its development, various courses is growing. Therefore, in October 1949, at the insistence of the Republic of Indonesia 400 high school graduates, and then PMIK announce the opening of AKADEMI NASIONAL who supervises five (5) Faculty, namely: Faculty of Social, Economic and Politics, Faculty of Biology, Faculty of Mathematics and Physics, Faculty of Letters Indonesia and ; Faculty of English Literature. The choice of the name of the Academy, not the University, intended to avoid colonial rule when it still applies to Jakarta. Step forward this PMIK widely positive acclaim all levels of society. Simple analysis of the first lecture on October 15, 1949 is a historical momentum that started the fight UNAS, so the date is set as the day of birth UNIVERSITAS NASIONAL. On December 22, 1949, the Ministry of Education and Culture, located in Yogyakarta provides full recognition and equality for AKADEMI NASIONAL with letter No. 548 / S. Under the applicable legislation, on 1 September 1954 through a Deed Mr. R. Soewandi Perkumpulan Memajukan Ilmu dan Kebudayaan of changes to Yayasan Memajukan Ilmu dan Kebudayaan (YMIK). Conducting coaching, development of science, education, technology and art through research activities. Practice of science, technology, and art through increased relevance of university programs to the needs of society through community service activities. Another development is also done through the realignment of faculty-faculty position in the environment of the National University based on the government rules that have been outlined, either by merging or splitting of the Faculty and the curriculum used. 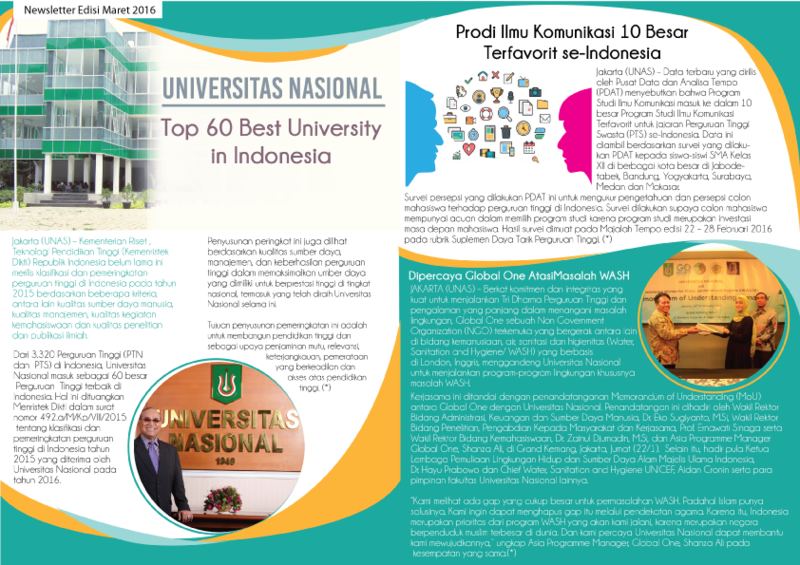 Since 2003 the National University in charge of 7 (seven) Faculty with 18 Programs. Besides, there are also three Academy of Political Science Graduate Program and the future will be divided. Thousands of UNAS alumni now scattered in various fields such as politicians, government officials, scientific experts, researchers, business professionals, artists and entrepreneurs. Some of them have been occupying the national figure. In the era of the last three presidents, UNAS alumni always acting as a minister, the latter is the State Minister for Acceleration of Development of Disadvantaged Regions, H. Syaifullah Yusuf, S. IP, as the youngest minister in the United Indonesia Cabinet. There are alumni who become expert diplomacy as he has held the foreign minister is Mochtar Kusumaatmaja. There are alumni who have served the Indonesian ambassador to Malaysia namely Hadi Wayarabi. There are alumni who became the first Doctor of Political Sciences in Indonesia, namely Prof. Dr. Deliar Noer. There are alumni who become experts, namely Dr. biological sciences. Endang Suhara, APU or Dr. M. Kasim Moosa, APU. 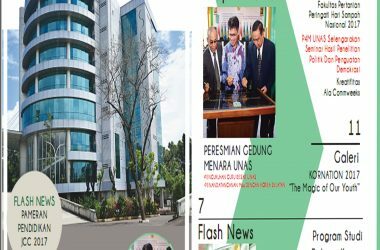 There are alumni who became an expert researcher in Indonesian Institute of Sciences, Dr. Sharif Hidayat, APU and Syamsuddin Haris, M. Si, APU. There are alumni who work as artists and legendary comedians such as Ateng, Jimmy Gideon or Unang as well as many other figures. In the current era of the third millennium, the challenge of competition in the world of higher education in Indonesia is more strict. Commitment to improve the quality of infrastructure and superstructure a barometer of the academic community colleges to choose which ones to support the bright prospects for the future of prospective students.Some community members even meet the cost constraints to achieve high-quality education. Especially after the government cut subsidies to public universities through the privatization program, it resulted in increased costs, so hard to reach limited-income communities. In this challenge, UNAS be kept consistent in maintaining the academic quality and capacity of infrastructure to improve public confidence. UNAS curriculum is now based on competencies that equip graduates with the skills, knowledge and attitude that is ready to be accounted for gait and his career in the community after graduation. UNAS also increase the capacity of online management information system so that the academic community and the global community can more easily and quickly interact with the UNAS through internet media. Yet the rapid development undertaken, UNAS remains committed to the nation. The commitment is embodied by setting tuition fees based on the philosophy: to give the broadest opportunity society, to achieve high-quality higher education.